it was lovely to welcome visitors from Cornwall at the Community Cafe today. They had Orphir Church connections. (Sorry, I should have made a note of your names). Thank you for sharing your family photos and allowing us to post this picture of your grandparents Rev James Sabiston and his wife Jane Anne (known as Jean). 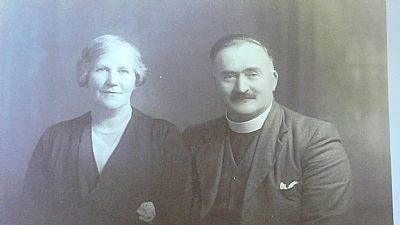 Rev Sabiston was the minister in Orphir from 1927 to 1933.